On the one hand there is the psychological reality of a child of this age, that is to say his particular needs and characteristics. On the other hand there is the answer, that of sowing the seeds of culture, which means the exploration of all subjects through appropriate materials and activities. Then there is the way, that of correlating the subjects with one another by means of the central and inspiring idea of the cosmic plan. This threefold approach constitutes the structure of the course. All three parts constitute the complete 2019-2020 brochure. 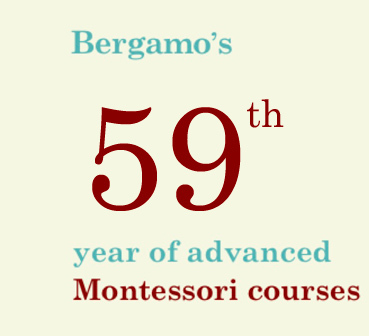 During the academic year 2019-2020, the Bergamo Centre will be holding its 59th fulltime annual course: years that represent a constant and profound commitment to the work carried on in the name of both Maria and Mario Montessori.